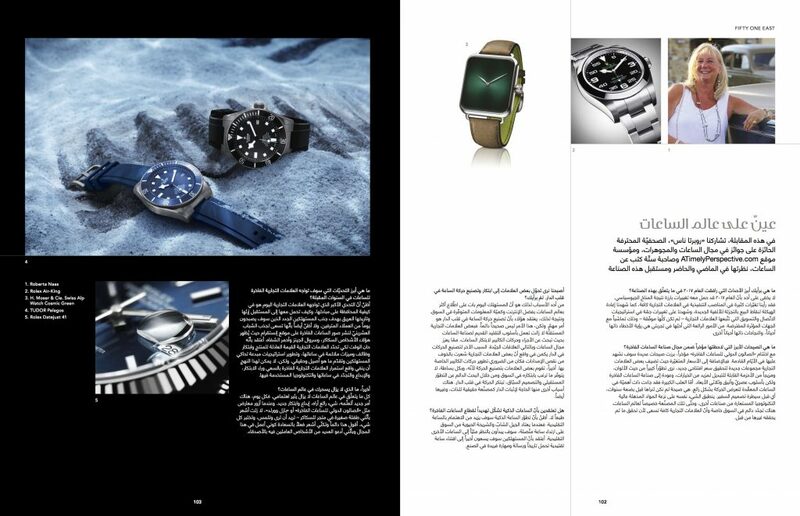 Fifty One East Magazine publishes interview with watch industry veteran journalist, Roberta Naas. 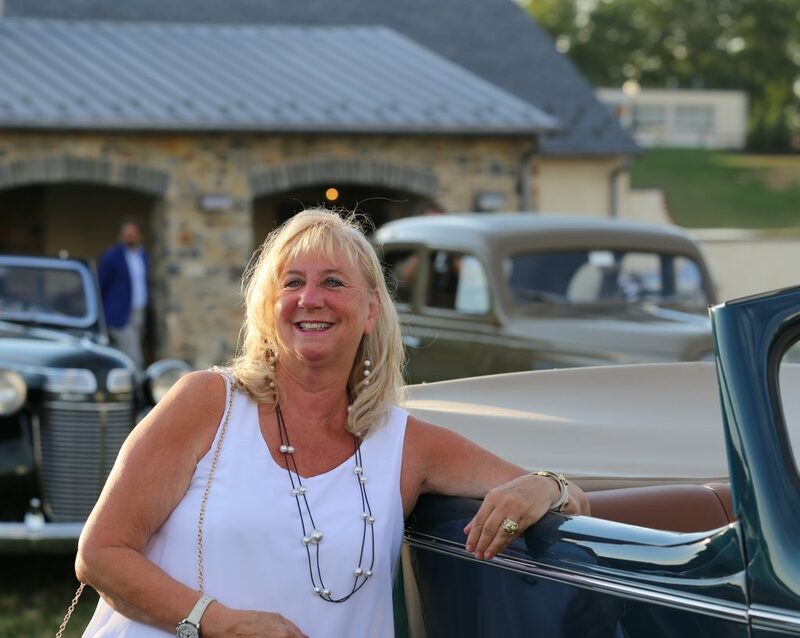 Not too long ago, Fifty One East Magazine conducted an interview with ATimelyPerspective founder and editor, Roberta Naas, about the state of the watch industry. That interview was published a few months ago. Today, we are happy to be able to bring those questions and answers about the industry to the forefront on ATimelyPerspective. This article was written and first published by Fifty One East Magazine. What were the highlights of 2017 for you in terms of what happened in the industry? – not always smartly — to align themselves with supposed influencers. One of the great things about having the experience I have is that you sometimes see the same mistakes being made, and sometimes the same successes. What are the greatest trends you perceive lately within the luxury watch industry? the shifting price ranges where certain brands are adding new collections to achieve a new opening price point, we are seeing great evolution of color, an infusion of interchangeable straps to offer more value and choice, and a return to fine watchmaking but in a modern, sleek, 3D manner. Big, boxed-like sapphire cases have become important in highly complicated watches as they offer a wonderful view inside the movement. A few years ago, before the engineering of sapphire was conquered, we would not have seen this trend. The same is true of the trend toward incredible high-tech materials borrowed from other industries, and even specially created for the watch world. There is so much newness on the market as watch brands strive to go where no one has gone before. 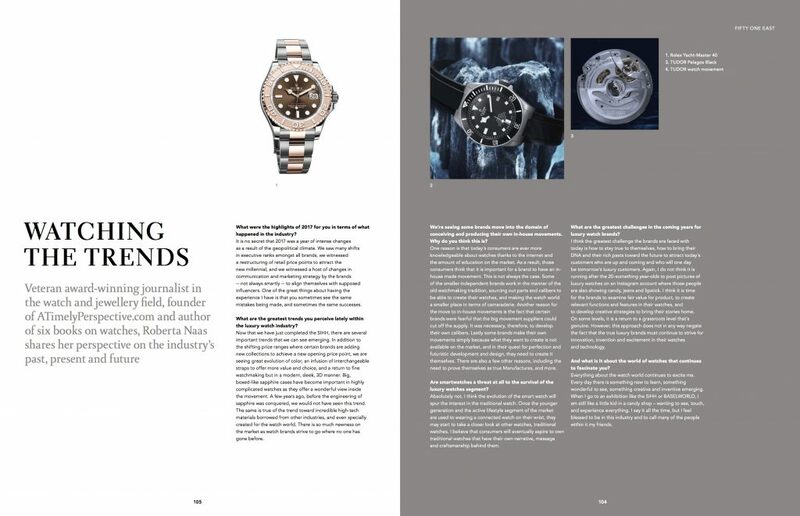 Fifty One East Magazine publishes interview with watch industry veteran journalist, Roberta Naas, who answers questions about trends, challenges and more. We’re seeing some brands move into the domain of conceiving and producing their own in-house movements. Why do you think this is? of the smaller independent brands work in the manner of the old watchmaking tradition, sourcing out parts and calibers to be able to create their watches, and making the watch world a smaller place in terms of camaraderie. Another reason for the move to in-house movements is the fact that certain brands were fearful that the big movement suppliers could cut off the supply. It was necessary, therefore, to develop their own calibers. Lastly some brands make their own movements simply because what they want to create is not available on the market, and in their quest for perfection and futuristic development and design, they need to create it themselves. There are also a few other reasons, including the need to prove themselves as true Manufactures, and more. Are smartwatches a threat at all to the survival of the luxury watches segment? are used to wearing a connected watch on their wrist, they may start to take a closer look at other watches, traditional watches. I believe that consumers will eventually aspire to own traditional watches that have their own narrative, message and craftsmanship behind them. What are the greatest challenges in the coming years for luxury watch brands? I think the greatest challenge the brands are faced with today is how to stay true to themselves, how to bring their DNA and their rich pasts toward the future to attract today’s customers who are up and coming and who will one day be tomorrow’s luxury customers. Again, I do not think it is running after the 20-something year-olds to post pictures of luxury watches on an Instagram account where those people are also showing candy, jeans and lipstick. I think it is time for the brands to examine fair value for product, to create relevant functions and features in their watches, and to develop creative strategies to bring their stories home. On some levels, it is a return to a grassroots level that’s genuine. However, this approach does not in any way negate the fact that the true luxury brands must continue to strive for innovation, invention and excitement in their watches and technology. And what is it about the world of watches that continues to fascinate you? Everything about the watch world continues to excite me. Every day there is something new to learn, something wonderful to see, something creative and inventive emerging. When I go to an exhibition like the SIHH or BASELWORLD, I am still like a little kid in a candy shop – wanting to see, touch, and experience everything. I say it all the time, but I feel blessed to be in this industry and to call many of the people within it my friends.